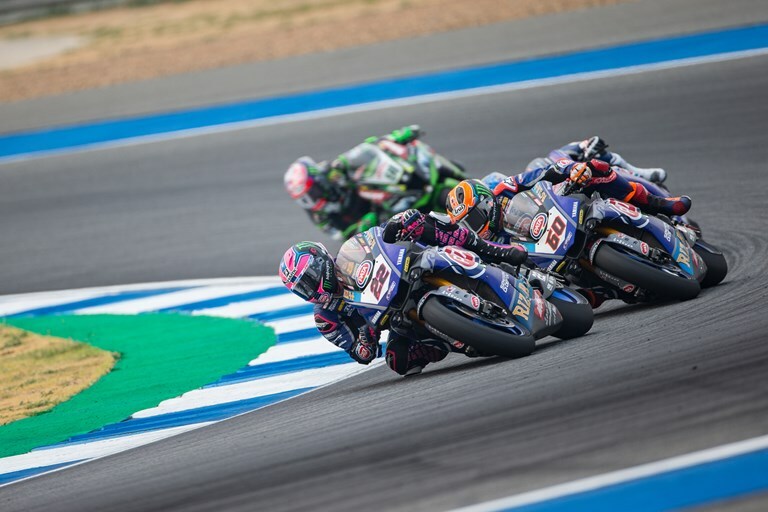 Pata Yamaha WorldSBK rider, Alex Lowes, charged his way to third place and his first podium finish of the 2019 season in a closely fought WorldSBK encounter, run over 20-laps at the Chang International Circuit in Thailand. After shadowing his teammate throughout the race, Michael van der Mark was unable to mount a challenge on Lowes in the final stages and had to settle for fourth place at the chequered flag. Marco Melandri overcame the stability problems experienced on the two straights in Buriram yesterday to take sixth place, after an intense battle with Leon Haslam during the closing stages of the race. WorldSBK rookie, Sandro Cortese, racked up more experience and more championship points as he raced to seventh place this afternoon. Lowes, starting from the front row of the grid after qualifying an impressive third during Superpole, was quick to find his rhythm in the early laps, battling briefly with eventual race winner Alvaro Bautista before getting his head down and maintaining a consistent pace. Lowes came under pressure from van der Mark from mid-race distance onwards, but the 28-year-old Briton held his nerve and rode a fault free second half of the race to hold off his teammate for third. Today’s podium finish elevates Lowes to third in the championship standings with 46 points. Van der Mark made an incredible start from tenth place on the grid, making up five places on the opening lap alone. The 26-year-old Dutchman had closed to within a bike length of his teammate by the halfway point in the race but didn’t have the additional pace needed to make a clean pass, forcing him to settle for fourth place at the line. The result promoted van der Mark up to fourth place in the standings with 42 points. Melandri was still struggling with a lack of stability on the two long straights that are such a major feature of the Chang International Circuit and, while a set up change did alleviate the problem somewhat, the compromise was a reduction in rear grip. Despite the issues the GRT Yamaha rider enjoyed a strong race, battling closely with Haslam for fifth place, only losing out to the Briton in the final few laps as he eventually crossed the line to finish sixth. Melandri remains the leading independent rider, but slipped down to fifth place in the overall championship standings with 40 points. Having lost touch with the group ahead of him by half race distance, Cortese endured a lonely second half of race. Despite being alone on track, the reigning World Supersport Champion maintained a consistent pace to finish seventh, his best result to date in a full length WorldSBK race. The four Yamaha riders will be back on track tomorrow for the Superpole race, for which the lights will go out at 13.00 local time.